Written by Catherine Saxelby on Wednesday, 27 March 2013. I recently happened to watch dietitian Matt O’Neill comment on the new Fast Diet (aka the 5:2 Diet) on morning TV. It caught my attention not only for Matt’s usual easy-to-grasp explanation but also for the book’s simplicity and lack of a set ‘diet formula’. So when I received a copy in the post, I thought it was time for a review. First things first, please ignore the ridiculous book title The Fast Diet. The marketing department have thought this one up – pair the word 'diet' with the word 'fast' and you've got a winner! With a clever play on the double meaning of the word 'fast'. Losing weight FAST is such a tempting promise to overweight people who are seeking a quick solution to what's really a long-term problem. The Fast Diet implies that weight loss will be quick and easy. Well it's not. Just watch the Biggest Loser TV series and you'll see how hard those contestants work every day to shed their excess weight [read my post here]. A more correct name would have been the Intermittent Fasting Plan or else the original 5:2 Diet. However, even this latter one is not quite right – it promotes the five days of normal eating rather than the two days of semi-fasting. If you're being realistic, it should be called The 2:5 Diet so you know you have to plan for two days of strict eating and five days of normal eating. It's dead simple. On two non-consecutive days each week, you eat little, cutting your calories to only a quarter of your usual intake which is roughly 2000 kilojoules (500 calories) for women and 2400 kilojoules (600 calories) for men. Say you fast each Monday and Thursday. These two days on the semi-fast are a form of intermittent fasting. I recall a similar diet from the 1980s known as the Day On, Day Off Diet. And there's an Alternate Day Diet too. You can distribute your intake in any way – Michael likes to have a breakfast and dinner so he fits in two 12-hour fasts yet gets to eat with the family. Mimi prefers to eat a lighter breakfast and dinner so she can have a couple of snacks to help her overcome hunger over the day. Very wise. To fill you up, there's lots of mineral water, tea, black coffee, raw veges etc., just to get over the hunger pangs. On the remaining five days, the authors say you eat what you like but really you have to eat a semi-balanced diet so as not to put on the weight you just took off. However this allows you to dine out, enjoy the odd piece of cake, or eat junk food, something that's banned on regular diets. The authors say you forget about fasting and just live normally which does have huge appeal. Best part – the diet doesn't last forever! On your fast days, you select foods that will satisfy you for the least number of calories. I hope this doesn't encourage obsessive calorie counting. The authors suggest this is protein (fish, lean meat, chicken, tofu) and low GI carbs (pasta, legumes, oats, low-fat dairy). Alcohol is out completely on the fast days. Who would the 5:2 Diet suit? Anyone like me who hates formal diets with their prescribed meal plans. Busy people who want to slip in a "light" day. be sensible on the five days and not binge to make up for the diet day before. It's been called the Feast and Famine Diet for this reason! 500 calories or 2000 kilojoules is NOT a lot of food. Expect to be hungry. You have to set your mind to thinking it's only for ONE day and live a day at a time. Use salads and non-starchy vegetables and diet drinks to fill yourself up for negligible kilojoules. Sashimi made with 3-5 pieces salmon 100g and tuna 100g served with soy sauce, wasabi and ginger. It won't suit everyone, especially if you're cooking for a family and want to sit down and share the same meal together. It doesn't teach you how to eat long term and how to re-train your taste buds. It encourages starve and binge habits which we all know can have serious consequences in young women. It's not for anyone with diabetes who needs to eat regularly or who is pregnant or breastfeeding. Definitely not for children. There are 10 menu plans of 500 calories for women and 10 plans of 600 calories for men. This is accompanied by 10 pages of colour pictures (the only pictures in the book). These shots are the highlight of the book for me – I bet most people will just copy the meals for their fast days! There are only two meals pictured for each day - one is a breakfast and the second is a dinner meal. Basically breakfast is some type of egg/cheese/yoghurt. Dinner has a substantial salad with heaps of leaves or a plate of non-starchy vegetables plus some protein – salmon, tuna, lean meat. Examples are Chicken stir-fry (with 140g of chicken), Vegetarian Chili (100g kidney beans), Thai salad with 30g prawns, and Tuna, bean and garlic salad (120g can tuna). There are 20 pages of testimonials and tweets from satisfied patients. There are 18 pages of a Calorie Counter but no attempt has been made to display foods in their common portion sizes. All foods are listed in Per 100 grams which is the standard portion in nutrition databases. Good for comparing where the calories come from but not helpful for everyday eating e.g. would I eat 100 grams of butter? No, but I could eat 100 grams of cooked rice which is half a cup. The only thing re-sized down are the dried herbs which are set at a tiny 1 g portion. How useless. The book finishes with the usual list of research papers from journals. Neither have qualifications in nutrition or dietetics. Michael Mosley is a UK medical journalist, producer and TV presenter. His Horizon Programme Eat, Fast, Live Longer had a phenomenal global response when it was broadcast on BBC Two in 2012. He lost weight and created this 5:2 approach after reading all the literature on intermittent fasting. Mimi Spencer is a journalist and feature-writer for newspapers and magazines including the Mail, the Evening Standard, Marie Claire, Harper's Bazaar. She is the author of 101 Things To Do Before You Diet (Transworld 2010). She made Michael's personal diet regime more practical with menu plans and charts and adapted it for women. The fast days are spartan and anti-carb with almost no grains and few oils or fats. However, they are a way to minimise your intake and not a way of eating for life. Like the Calorie Restriction philosophy to extend lifespan, however, your meals are packed with vegetables, salads and fruit so you'll get a high intake of vitamins, minerals and antioxidants but you will be hungry. It won't suit everybody nor does it teach you good nutrition but many people already cut out eating after a big night out or "save up" for a dinner out by not eating at all during the day. And many follow religious fasts such as Lent or Ramadan. As a way to dial back your intake and simply eat less, it's quite bearable because it's only for two days. Can you follow such a regime long term? I'd love to hear any feedback if you've tried it. The book is nicely written, easy to read, with a warm friendly tone that switches from Michael's to Mimi's perspective. I liked the 10 days of meals. Helpful and realistic. 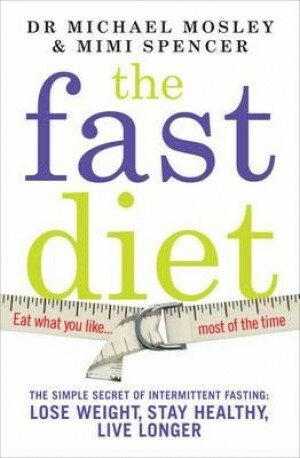 The Fast Diet is published by Allen and Unwin for $19.99 and is available here.